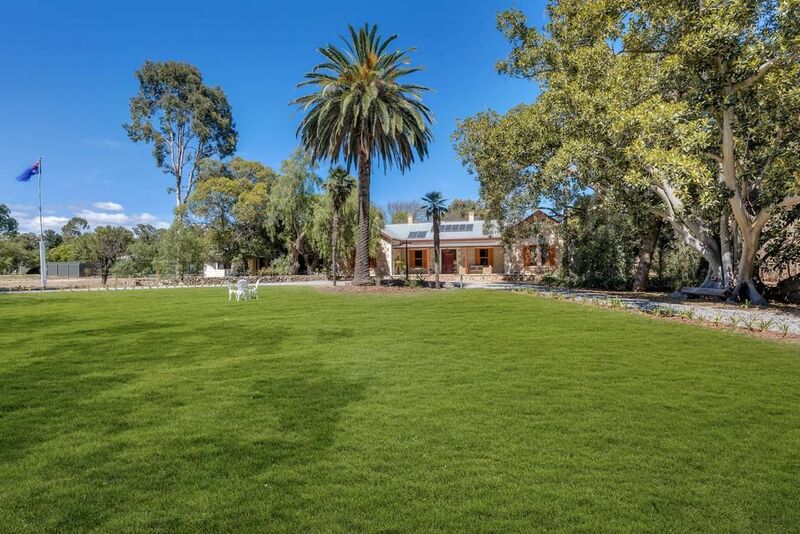 Bungala House is a rare treasure- We have just completed a 4 year renovation of this magnificient 14 roomed historical mansion and are very excited to be offering exclusive use of the main house, luxuriously accommodating up to10 guests. The grand residence sits in 4.5 acres private parklands, a wonderland to explore with many ponds, arbors, wisteria walkways & a walled courtyard which makes you feel like you are in Tuscany. There are many table settings in the garden and two full size BBQ's. It is also home to an abundance of wildlife and 4 resident Peacoks (including two rare white Peacocks), who often dance with excitement & show off to guests. Breakfast provisions are provided for your stay along with kitchen essentials. Entrance hall is very grand, complete with a piano & antiques. The large front door is framed by a stunning imposing stained. The drawing room is massive & has a pair of large crystal, oversize ornate (working) fireplace, antiques & luxurious velvet furniture. There is a smart TV with Netflix and bookcases filled with antique books. Double casement doors lead through to the formal dinning room with a beautiful table setting for 12, hand painted decorative art on the walls with crystal sconces, a beautiful chandelier, oversize ornate fireplace (working). This makes for an elegant atmospheric dining space- (even if you just get a takeaway delivered). Fine china & silverware & crystalware are available for your use. There are 5 bedrooms. Every bedroom is luxurious, all beds are dressed in fine imported linens & high quality towels. Each suite has it's own lounge or sitting area with TV plus mini fridge and tea/coffee making facilities. THE MASTER (an entire wing )- absoultely enormous with a king size four poster bed, a pair of crystal chandaliers, a very large armour, dressed with antique. The seating area has a beautiful lounge setting, large flat screen TV (free to air), small fridge & tea/coffee making facilities. Huge windows overlooking the front lawns draped with gold swag & tail curtains. The master also has a brand new contemporary ensuite with double ended bath, double vanity & a huge shower. A large elegant bedroom with opulent king bed, decorative paneling and its own private lounge with handpainted chinoserie on the walls, filled with antique furniture and a flat screen TV. plus en-suite and private garden area. THE OLD BALLROOM-a large room with old world opulence. Beautiful crystal chandalier, king size wooden bed, a pair of gold thrones and an oversize fireplace. It really is such a beautiful room to wake up in. The brand new contemporary en-suite finishes this suite off beautifully. The ELI BUTTERWORTH ROOM- A large bedroom with a king bed with antique furniture and a seating area with a lovely plush carpet. +shared bathroom - a brand new contemporary bathroom with walk in shower. The lounge room- a lovely homely lounge room, perfect for relaxing. 2 large sofas, large TV (with Foxtel). KITCHEN- certainly has the wow-factor. The impressive skylight is the first thing everyone notices. Beautiful furniture, a 6 seater table with handpainted spindleback chairs. Large italian cooker, dishwasher, large fridge, new tasmainan oak counters and fine carera marble subway tiles look stunning - this kitchen gets featured in magazines.It is very large & we are told it is the perfect coutry kitchen but has all the mod-cons. THE BREKFAST ROOM - the perfect spot for a communiual breakfast (full breakfast provisions provided). The 12 seater table, pressed tin roof, the skylight, the old aga and the bench which was the origional laundry trough from Victorian times- it just oozes character. A small laundry houses a washing machine & dryer. Pricing inclusive of breakfast daily, WIFI & parking. Towels /hairdryers/irons /shampoos/conditioners /soap /pool towels etc are provided. We are a friendly couple who just love spoiling our guests. We are respectful of guests space & privacy but are around should you need anything Please note : we live in a cottage within the Bungala House Estate. It is rare to find a property of this calibre. Bungala House is located in the quaint township of Yankalilla. The beautiful countryside of the Fleurieu Peninsula, an hours drive South from Adelaide (73k's). Normanville beach is only 5 minutes drive or just hang out at your own private pool. Bungala House is perfectly located to explore the attractions of the Fleurieu Peninsula, recently listed by Lonely Planet as the fifth most attractive destination in the world. Yankalilla is a great stop before Kangaroo Island. The Kangaroo Island Ferry Bus service also stops 2 minutes walk from Bungala House (Sealink Ferries). With a friendly country town feel, Yankalilla is home to shops, cafes a restaurant, pub and boasts a country bakery worth driving for. Within walking distance are cafes, a pub, bakery, little vintage shops, a takeaway & a supermarket. Normanville & its fabulous beach 5minutes drive (& a wonderful beach café). Also Normanville has another pub, a number of cafes & many little shops. 10 mins drive to award winning beach Carrickalinga. Only 5 minutes to Allusions Winery - soak up their spectacular views with an antipasto platters or cheese plate & a bottle of their wine. Why not explore McLaren Vale with it's amazing wineries less than 30 mins drive, follow the food & wine trail "Epicurean Way", visit local Micro Breweries or hike along one of the most spectacular parts of the Heysen Tail. Golfing : Four quality 18 Hole Golf courses with grass greens are within 5- 30 min drive. Fishing: Charters available from Wirina Cove (15 mins drive), from there it is a short boat trip to the pristine Gulf waters. These waters produce sought after King George Whiting, Tuna & Snapper. Full Day Charters to Kangaroo Island waters also available. Hiking or Bush Walking : Deep Creek Conservation Park under 30 mins drive away. Featuring Hysen Trail and many other well marked walking tracks. A photographers delight. Dining options vary from fine dining at award winning Leonard's Mill to grabbing a packet of fish and chips at the beach whilst watching the sunset and dolphins. Enjoy breakfast lunch or dinner on the spectacular deck of Normanville Beach Cafe & soak up those views - talking of views, Peninsular Bar & Restuarant is always a winner -overlooking the golf course with Kangaroos jumping around & the sea just past the vineyard - it is just gorgeous. Experience horseriding on the beach, quad biking, scenic flights from Aldinga or use this as a gateway to Kangaroo Island - there are so many options for you to enjoy. Finally on a clear night the skies are amazing - a local company called Backyard Tours can bring all the professional stargazing equipment to the grounds of Bungala House (for a small fee). What an experience. It is truly breathtaking part of Australia.